Hypertension is poorly controlled in numerous patients despite effective medication being available. Catheter-based renal denervation (RDN) has emerged as an alternative treatment option. We aimed to assess how likely patients with elevated blood pressure (BP) are to accept RDN as treatment option. 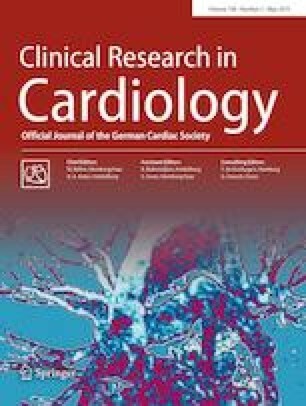 A questionnaire-based cross-sectional survey was performed in patients with elevated BP in Germany. Data on patient demographics, clinical characteristics and treatment preferences were collected, anonymized and analyzed. One thousand and eleven patients completed the survey. Mean age was 66 years (55% male). If not already on medication (n = 172), 38.2% of patients would prefer RDN. Of those already on drug therapy (n = 839), 28.2% would opt for RDN. Patients who were pro-RDN were younger (p < 0.0001) and more often male (p < 0.0001). Nineteen percent would choose RDN if it lowered systolic BP by at least 20 mmHg, more than 40% if they did not have to take any more pills thereafter, and 30% if it would lower BP by at least 10 mmHg. Experiences of side effects and drug adherence were identified as determinants of patient preference. Physicians were the main source of information regarding medical problems (95.5%) and influence patients’ decision regarding therapies (98%). This survey found that a significant proportion of patients would choose catheter-based RDN over lifelong pharmacotherapy. These patients were younger and more likely to be male but their expectation of the extent of BP decrease with RDN was high. Physicians are key mediators for treatment selection. They need to incorporate patient preferences into shared decision making. These data have been presented in part at the 2018 Annual Meeting of the European Society of Cardiology (ESC) and at the open public hearing of the Food and Drug Administration (FDA) on December 5, 2018. This survey was supported by an unrestricted grant by Medtronic, Inc., Minneapolis, USA (Grant no. A1355749.001.1). We gratefully acknowledge the expert assistance of Ingrid Fleischmann and Kristina Striepe. RES received Speaker fees, Consultancy and Advisory Board fees from Ablative Solutions, Medtronic, Recor and ROX Medical. Research grant to the institution has been given to RES by Ablative Solutions, Medtronic, Recor and ROX Medical. RV received a research grant to the institution from Medtronic. All the other authors have no competing financial interests to declare. Ethical approval was obtained (University of Erlangen-Nuremberg, Germany).